Our glass mug is simple and well-designed! Our mug is large, lightweight yet sturdy, and effortless to use. The stainless steel infuser is accented with a cheery silicone band; this silicone band prevents chipping the rim, and keeps the edges cool for easy removal after brewing! 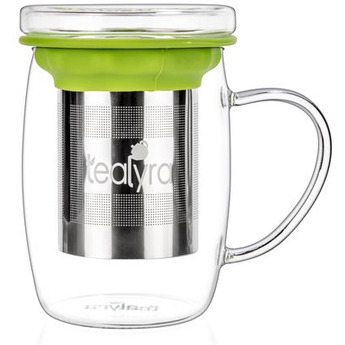 The infuser is easy to load and clean, and fits snuggly on the glass mug itself. The glass lid is slightly convex so the condensation drips back into the mug; it can also be used as a “coaster” for the infuser once the tea is steeped! It’s the little things that count, and we think our mug does just the trick!